ISS Visible in the Southeast US - Solar System Planets And Moons Section. Discovery and ISS Will Be Visible in the Southeast US. Discovery's ground track on August 6th. Image credit: Chris Peat and Heavens Above. Skywatchers in the Southeastern United States will have an opportunity to watch the International Space Station and the Space Shuttle Discovery fly overhead on Saturday morning at 5:50 am CDT.. Discovery will have undocked from the station three hours previously, so the two objects will be separated visually by about the width of the Moon. As a special bonus, the two spacecraft will pass close to the planet Mars as well. If you live in south Florida, central Texas or near the Mississippi River Delta, you're in for a treat. This weekend the Space Shuttle Discovery and the International Space Station (ISS) are going to orbit over your part of the country. Shining like very bright stars, the two ships will glide in tandem across the sky - a lovely sight. The flybys commence on Saturday morning, August 6th, at 05:50 a.m. CDT when the pair can be seen from New Orleans, Mobile, Biloxi and surrounding areas. Discovery will have just undocked from the ISS about three hours earlier. This means the two ships will be separated, but still close together. Side by side apparitions of two bright spaceships are rare and beautiful. "Based on their predicted separation of 7 km, their angular separation should be 1o - only twice the diameter of a full moon," says independent satellite tracking expert Ted Molczan. Which ship is which? The brighter light is the shuttle. Although Discovery is smaller than the ISS, its super-white top reflects more sunlight. Both ships should be easy to see in the deep-blue dawn sky. Bonus: Discovery and the ISS, coincidentally, pass close to the planet Mars. If you're an early riser, you've probably noticed Mars shining high in the sky before sunrise. If you haven't noticed Mars yet, you will on August 6th. Discovery and the ISS will lead you right to the red planet: sky map. August 7th should be a good morning, too, with flybys over south Florida, parts of Texas and Oklahoma. By then, says Molczan, "the two ships will be more than 250 km apart; the ISS would trail Discovery by 30 seconds or so - still worth observing, but not as spectacular as on August 6th." Miami and Dallas are favored with particularly good apparitions: the two spaceships will be bright and, once again, close to Mars when they pass overhead. Finally, on the morning of August 8th, the shuttle is due to land at the Kennedy Space Center. Reentry won't be visible from much of the United States. 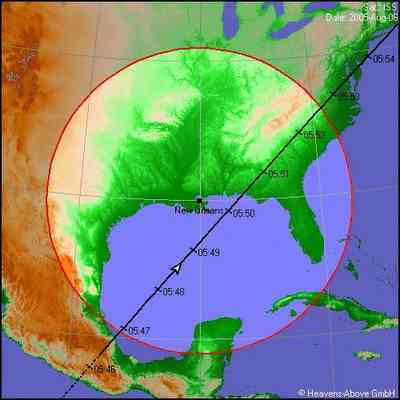 The shuttle's intended trajectory takes it over the Yucatan Peninsula and the Gulf of Mexico. To the unaided eye, Discovery and the ISS are compact points of light. You can't actually discern, e.g., the wings of the shuttle or the station's vast solar arrays. How about looking through a telescope? It's not easy, but it can be done. The two spaceships move slowly across the sky, taking about five minutes to cross from horizon to horizon. With a little practice, you can train a small telescope on the pair and manually track them. Then you can see their outlines. The space station's T-shaped solar arrays are eye-catching; people who have seen them are impressed by their eerie copper color. If you've never seen a shuttle flyby before, however, don't spend precious minutes fumbling with a telescope. Look up and, using nothing but your eyes, simply enjoy the view.